this image, and the previous one, are going to be used for Blog Candy later on today/tomorrow. I did promise I would make have some when the counter reached 250….and as it’s creeping up I thought I would make a start on getting it ready. Coloured with COPICs – what else do I use these days girls? Just a first colouring of this delightful Sugar Nellie image. She’s soooo sweet. I more often than not work by colour an image, and then see where that leads………but it’s different strokes for different folks really, and other people like to pick the main paper, card, stamp etc., and then start. It was my turn to supply this month’s kit, and shame on me, I still haven’t done my own entry. I need to get this done. I did try, honestly I did, earlier in the month, but I mucked up two of the images before I matted them, then I kind of lost interest – bad girl. I’ve just spent a few minutes wrapping some pressies, but it really doesn’t feel anywhere near Christmas (not that I like the season anyway). Maybe when there a few more wrapped things, and I’ve got my birthday over with I might feel more Xmasy. Stamps: Mermaid (Magnolia) Shorecliff Cube (Stampington). Make 6×6 cardblank using Scor-it board. Cut pattern paper to 5.5 x 5.5. Punch ticket corners and run round the edge with the Perfect Pulmaria Versamagic. Place a piece of the word vellum down the left hand side, and mount onto the card. Cut a piece of Papaya Puree Medium cardstock to about 4.5 x 4.5. Stamp with the Stampington cube in both Perfect Pulmaria and Pearlescent Purple – I used the starfish and mesh images. Run round the edge with the Perfect Pulmaria ink, and place on the card at a jaunty angle. Cut a piece of the Sage Green Medium cardstock to about 4.5 x 4.5, and tie round a piece of cream ribbon. Mount to the card at an opposite jaunty angle to the Papaya. 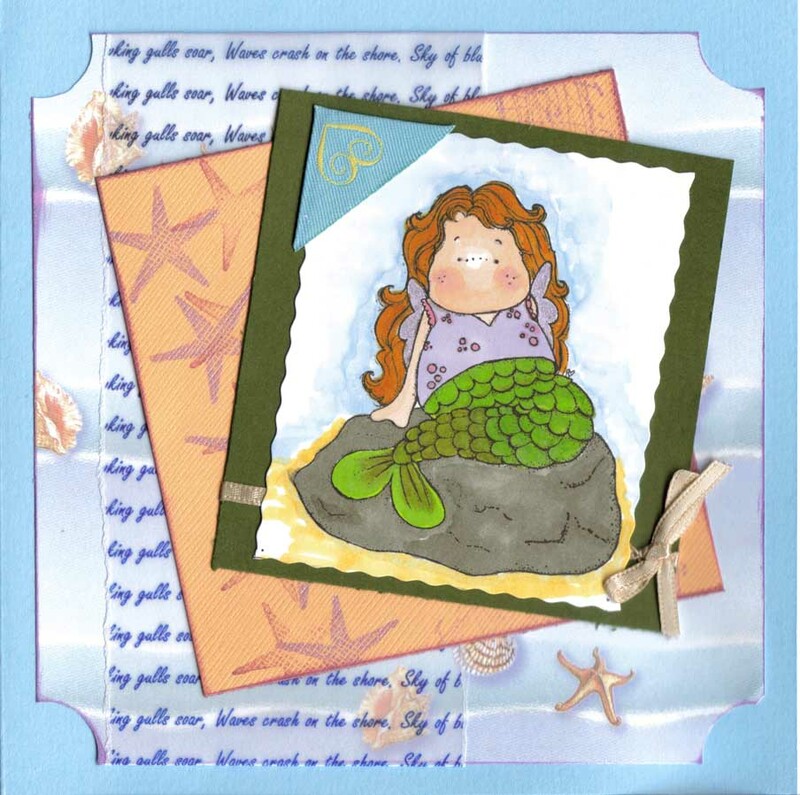 With the A5 Purple Cow cutter and the fluted blade, cut a piece of white cardstock to about 3.5 x 3.5 and stamp the mermaid image with Palette Noir. Heat set and colour in with the COPICs (I only have a limited range, and there is a list of the colours somewhere on the blog). Add the giveaway photocorner to the top righthand side and mount on the green matt. Line the inside of the card – I stamped the starfish image on mine. I also tend to stamp the envelope with a co-ordinating image. a thank you from my Mum and the other Italian students. So simple to do, it was just a Penny Black Stickeroo, matted several times Wizard Dark, Apricot and Dark Green cardstock. 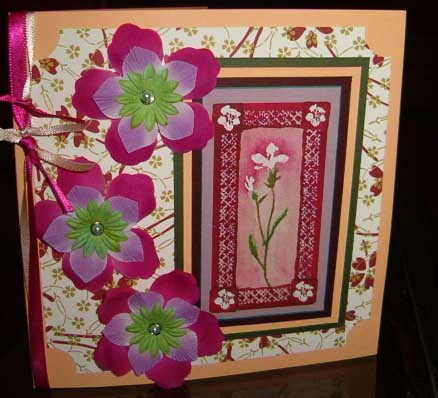 The card blank is a 6×6 apricot, with a matt at about 5×5 in the lovely floral paper from 7g’s Sushi Journey 6×6 pack. I did the usual ticket corner effect with my star punch, and then added the matted Stickeroo to the right hand side. The pink and lilac flowers were from a Papermania Embellishment pack I got ages ago, the green are Prima Crazy Daisy “Jasmine” (actually I can’t believe that there are so many of the Primas in one pack, it’s just going on and on). Jewel brads in the centres of the flowers are also Papermania (left over from the wedding cake I did in July). I then just tied pink and creamy ribbon down the side. this is just how messy the small section that I have left in the middle looked last night after I’d finished the cutting and mounting session. I really need to tidy up before Friday. this one, I believe is called Mysterious Tilda from the invoice.I really like her, and can see that she will be used over and over. Just got back from seeing Caz this afternoon, it was lovely to see her and talk to her fabbie little chaps (who are just so adjorable). I’ve put in an order for a couple of SU bits – very exciting for me, as I don’t own a single SU product yet. I also proudly came away with a catalogue……….thank you so much Caz, I can’t wait to snuggle down this evening with it. Last night, I managed to cut and mount all my Nov/December Magnolia Stamp Club, and hit upon the idea of adding the info on the back of the EZ mount (just so I don’t lose track of which month it is later on). 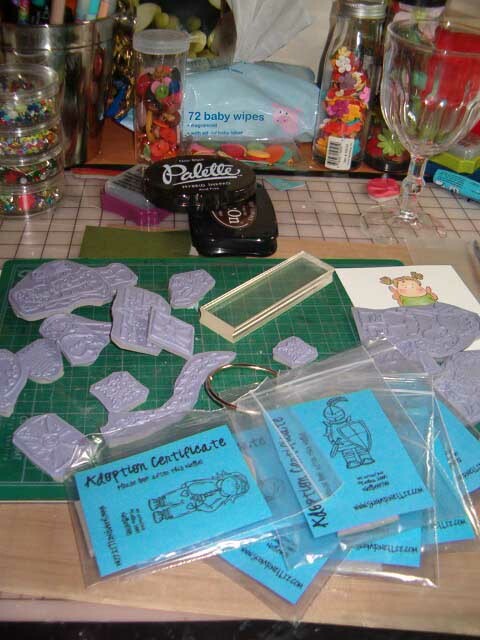 Unfortunately, not had a chance to play yet – but I’m off for the next two days, and there will definitely be a bit of stamping on the go – especially as on Friday some of the girls from UK STampers are coming over. 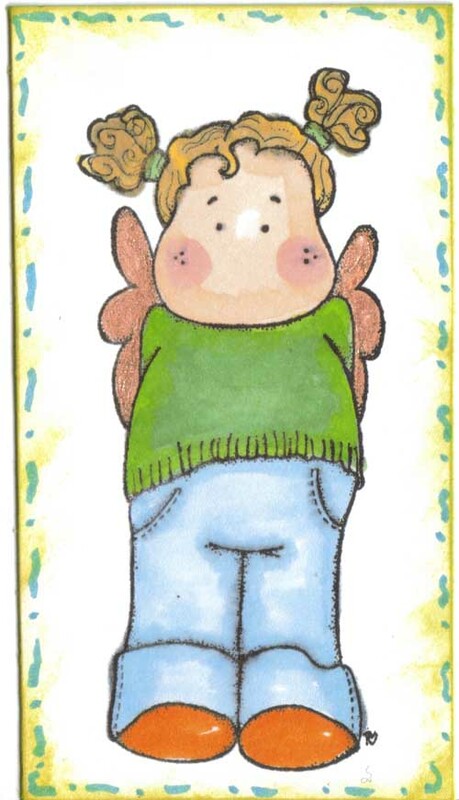 Actually if Angel reads this, can you bring a nice large angel image with you for me to play with?